Painting basement floors is not a lasting solution as paint can, and usually does, chip and peel over time. Paints will sit on the surface and lose their bond to the concrete, even with normal amounts of evaporation. Stains, however, make a permanent color change to a concrete surface via chemical reaction with the concrete. With basement paints, you are also often limited to the 2D. In addition to traditional matte or gloss finishes that paints can assume, basements can be scored, taped, and otherwise manipulated to resemble other flooring options which are costlier and/or not as moisture resilient, such as wood. Pay particular attention to avoiding "acrylic stains" as these are disguised paint and will also peel with time. Concrete Acid Stains are the only true stains with permanent results. When finishing a basement, concrete floors are widely considered one of the more inexpensive flooring options. Basic carpet can cost on average $3.50 per square foot with installation, laminate around $5.50 per square foot, and hardwood around $8-10 per square foot. When doing it yourself, the products involved in staining concrete run on average about 50 cents or less per square foot total for larger areas or about $1.00 per sq.ft. for very small areas. With concrete in good shape, the cost for tools and cleaners needed is minimal. However, a concrete surface that is in bad shape can cost a bit more to clean and prep, possibly requiring buffing equipment or cleaners to remove gunk and blemishes. That being said, concrete stained floors are much more equipped to handle changes in ambient humidity than wood flooring and carpeting, making them a longer-lasting option. And, even though options like ceramic or porcelain tile flooring cost around $1.70 per square foot, they are prone to chipping and cracking with natural shifts of the basement floor below. Staining a basements is often no different than staining concrete floors in any other room of a home. However, this is largely dependent on the presence of extraneous moisture. Having a proper moisture barrier, moisture isn't an issue for some basements, but those that do not have an adequate moisture barrier, moisture can be a common issue to deal with for basement flooring options. With moisture seeping up through the foundation of the home being a regular occurrence, the basement happens to be one of the dampest rooms in the home. 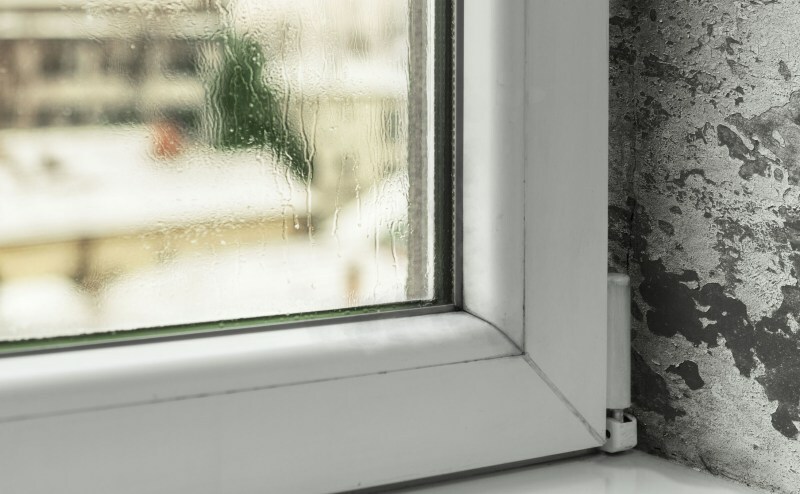 Even with a sump pump or french drains, basements located in areas with a high water table and not having an adequate moisture barrier are largely affected. Moisture present in/on concrete can increase the drying time of a stain. It can also cause dilution of color in low quality stains. These may appear darker initially due to the high moisture content, but the resulting final color will be lighter. Using high quality acid stains like our Artist Grade or Pro-Etch stains will limit the effects of dilution caused by prevalent moisture. For more in depth step-by-step instructions on how to stain interior concrete floors, be sure to read our all-encompassing "How to Stain Concrete" guide. If the basement has a moisture problem, make sure to pay extra attention when removing the residue from the stain. Artist Grade stains can be left unsealed, and some people may prefer to take this approach to avoid moisture related sealer problems. However, if a stained floor is left unsealed and the residue has not been properly removed, there is a likelihood of tracking that residue to other areas. A thorough rinse with a mop or use of wet/dry vac will definitely suffice. There is no need to use something as strong as a pressure washer to remove the residue, as that can damage a very new stain. Proper sealing requires minimum interference from moisture. If sealant dries on top of excessive moisture, it can be cloudy and lead to the sealer eventually losing its bond with the concrete, causing flaking. Moisture trapped beneath a sealer disturbs the surface of the sealer as it tries to evaporate. Luckily, this is primarily a characteristic of mixed acrylic sealers and not pure acrylic sealers like our Clear Shield Advanced and Premium Formula water based sealers. Pure acrylic sealers like Clear Shield Advanced and Clear Shield Premium will allow a certain amount of moisture to wick (permeate) through the sealer and evaporate by design. However, this wicking will be negated in cases where extreme amounts of moisture are present. It is not recommended to wax concrete basement floors with moisture issues. Waxing will further trap moisture beneath the surface of the sealer with another layer. A major issue which arises in concrete with excess moisture content is efflorescence. Efflorescence is the rising of salts to the surface of concrete during the evaporative process. This causes a white powder-like substance to become visible on the concrete. An effective way to combat efflorescence is to use a proper acrylic based sealer, and in more severe moisture cases, having proper grading and draining setups in place. At Concrete Camouflage, we have a "cracks add character" mindset. 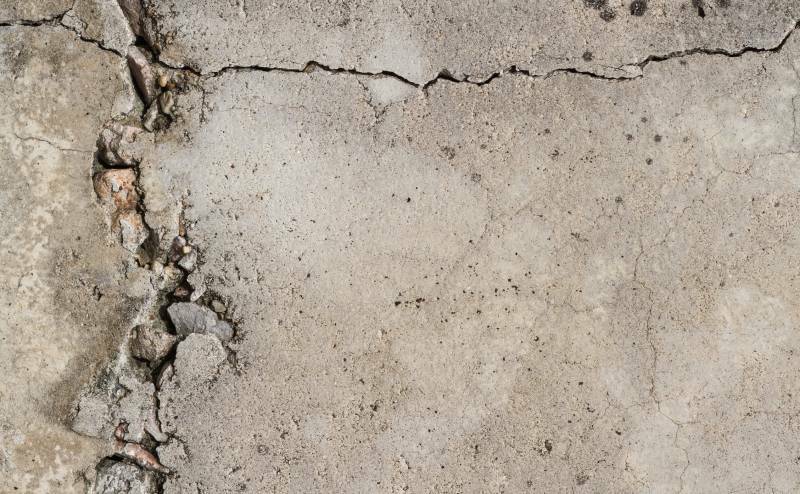 It is perfectly normal to have cracks in concrete due to shrinkage as concrete sets. Stained cracks in concrete are also a lot less unsightly then cracks in tile or laminate. Patching small cracks is not necessary, but cracks large enough to fit a coin require some attention. Proper sealing techniques will prevent moisture from seeping through in hairline cracks, but using a cementitious product to fill in deeper cracks will be necessary. It is also important to note that patched areas will not stain exactly the same color as the rest of the concrete, however this can be easily camouflaged or even add to the overall look of the basement floor. Testing the stain on a dried sample of the patching substance that will be used can help better estimate the final look. If you notice heaving of the floor (one cracked part of the slab rising above the other), or can visibly see bowing of the basement walls, it might be a good idea to examine the situation further. These may be indicative of a larger problem with the foundation of the home. Issues with basement walls themselves can be a matter of structural integrity. It is always important to test the color of the acid stain for a concrete floor. Not only can moisture affect the overall color of the stained floors as previously mentioned, but also the makeup of the concrete slab. The unique sediment makeup of individual concrete mixes increases the likelihood of stain color results varying widely. For example, although you may intend to stain your slab a grey color, you may see that your concrete wants to learn towards hues of brown. This, however, is not necessarily a negative. As no two stains look exactly alike, you will always get your own personal unique stain. 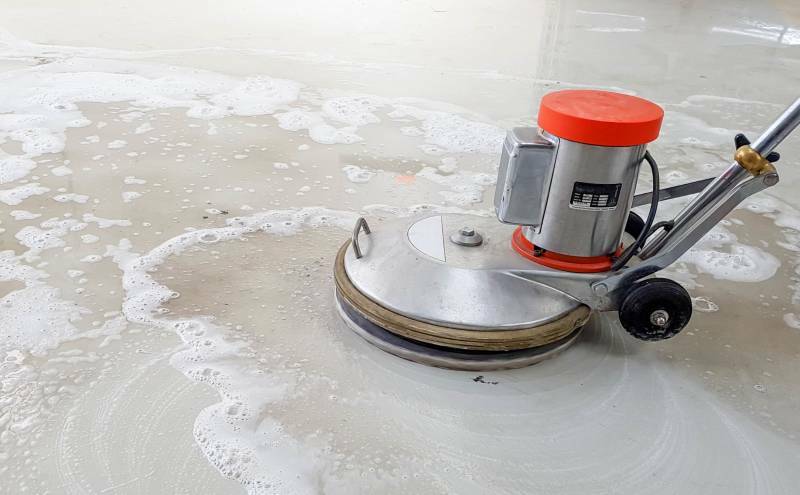 Having the pores of concrete floors open is not only important for the stain to be able to penetrate the surface of the concrete, but also helps ensure the bonding of the sealer. If a concrete slab is trowled or polished too tight, it can be a problem. Using a buffer machine with the aggressive black scrubbing/stripping pads can help open the pores up and can help remove contaminants. All waxes and concrete curing agents should be removed from the concrete before staining. This can be done with citrus strippers. A good test of finding whether concrete is covered with a wax or had a curing agent applied is the water test. If you pour water on the concrete and see it beads up instead of soaking in, it may be waxed or have a curing agent applied. If you are staining a concrete floor that is in too cold of an environment (below 40F), the drying of all stages will be slowed. To help encourage normal drying, especially after the cleaning stage, you can use a heater to bring the temperature up. However, you will need to make sure the heater is off during the staining and sealing stages to prevent premature drying. In cases where the ambient basement temperature is too hot (above 90F), the stain could dry too fast, making it harder to keep overlap lines from forming. It can also increase the likelihood of humidity causing issues with your sealer. If you are not dealing with a moisture problem, you should wax your floors on a regular basis to limit the need to reseal. On average, wax should last several months. But, if the wax becomes dull or scuffed at any point, it is time to clean the concrete and rewax it. When performing regular cleanings, use mild detergents. Do not use harsh cleaners like Ammonia or soaps like Dawn as these can strip the wax. If you cannot wax your stained concrete floor due to overabundant moisture, you will need to continue to reseal the floor. This will prevent high traffic areas from getting wear patterns over time. The frequency of resealing is dependent on the amount of use the floors get, and can vary from 1-5 years. In the end, concrete acid stains can be a cost efficient, and longer lasting, alternative to traditional flooring options. Concrete is also durable and flexible enough to overcome basement related issues such as cracking and moisture. 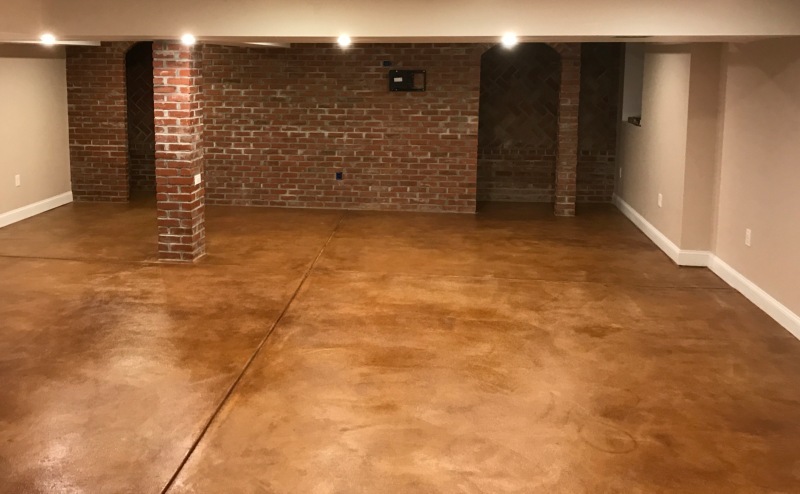 There may be some minor maintenance involved, but concrete stains are ultimately a fun and expressive way to make your basement shine for years to come.